I wrote this article long enough ago that it refers to “integration tests”, when I really meant “integrated tests”. I have chosen to leave this article unedited, in part because this article underscores the problems behind my having called them “integration tests”. Sorry about that, folks. 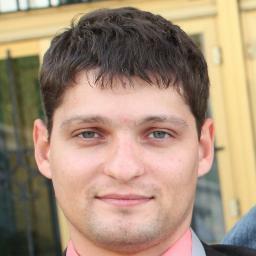 My friend, Artem Marchenko, had a comment about my recent writing against integration integrated tests. I agree with this sentiment. I tell the story of my very first attempt at test-first programming1, how I wrote about 125 tests, many of which fit my definition of “integration test”, and which took 12 minutes to execute. This meant that, on average, I only made 8-12 edits per hour when writing that code. I recognized then, and I still recognize now, that even making only 8-12 edits per hour—4-6 edits per hour towards the end—that I produced better software than I did when I would write code almost continuously for several hours at a time. As much as I disparage those integration tests today, I appreciated them a great deal at the time I wrote them. I find integration tests useful for finding system-level problems, as the first step in fixing a mistake, and if I genuinely can’t write a focused object test, then I will usually write an integration test. As you say, Artem, I simply don’t stop there. 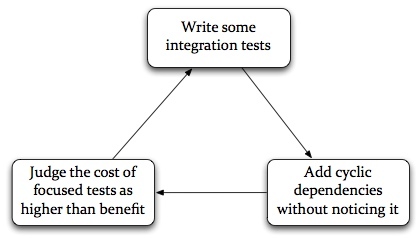 When I label integration tests a scam, I mean to emphasize the self-replicating nature of integration tests. It starts simply enough: you write a handful of integration tests, which give you a lot of freedom to implement your design in a way that introduces unfortunate dependencies, which makes focused object testing quite difficult. As a result, you will probably resign yourself to writing more integration tests, which do nothing to improve your dependency problems, and the cycle begins again. Integration tests help cause pain, even though they appear to help reduce pain. Therein lies the scam. I must acknowledge this: if you started writing tests this week, or this month, or even this year, then you will probably benefit more from writing integration tests than trying to write perfectly focused object tests. I have said and written elsewhere that I believe a programmer needs to write about 1500 to burn into her brain the basic patterns of good tests. Even so, as you write those tests, I want you to remain aware of the cost. Even if you don’t know how to write a good, focused object test, if you want to write more such tests, and especially if you try to write more such tests, then I will have completed the first phase of my mission to eradicate programmer reliance on integration tests to show the basic correctness of their code. Join us! Turn one integration test into a small suite of focused object tests today. If you don’t yet see how to replace an entire integration test with equivalent focused object tests, then write at least one or two focused object tests along side the integration test. Try it. I promise, you’ll like it. One last comment to my good friend Artem: please don’t put me to sleep with the word “just”!